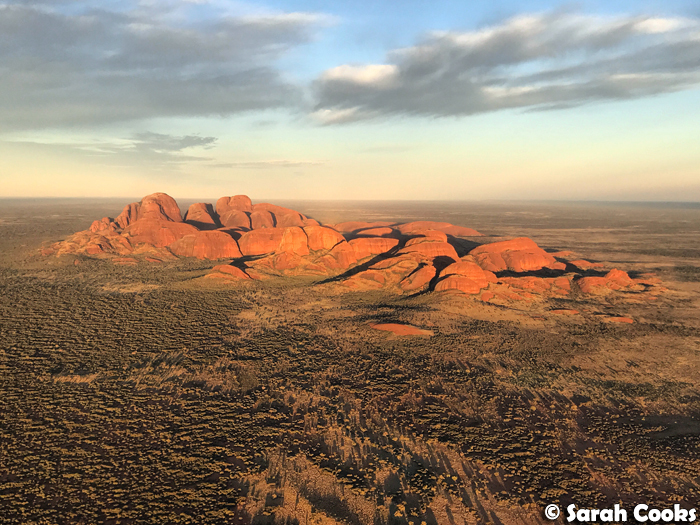 Location: Uluru is really, really remote! 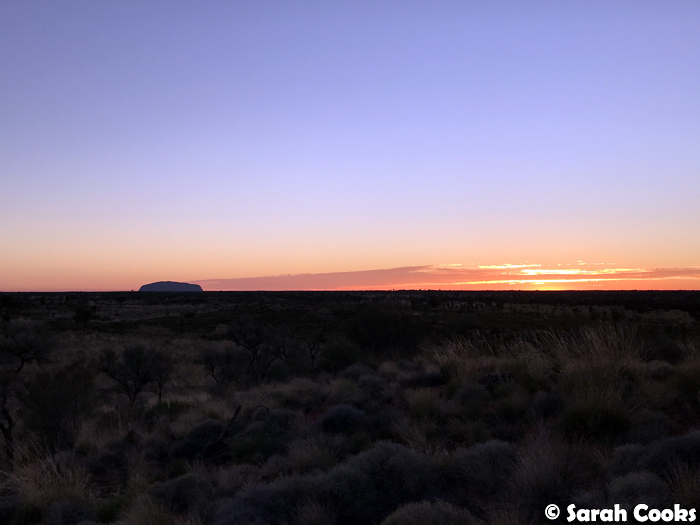 I feel a bit dumb for not realising this earlier, but speaking to friends it seems quite common to underestimate just how remote Uluru is. I always thought Uluru was close to Alice Springs. Well, not quite - Alice Springs might be the closest town, but it's still 462 kilometres away, or nearly a six hour drive. 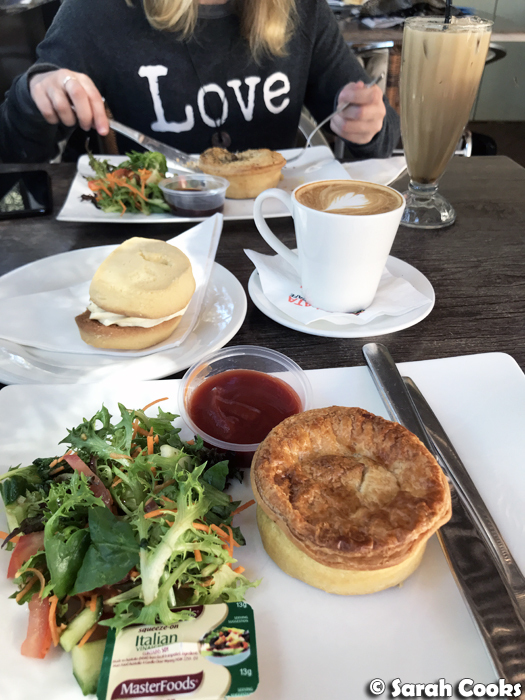 The Resort: Pretty much everything for tourists and workers is based in the Ayers Rock Resort complex, which contains all the accommodation options, the staff quarters, and a town centre (which has a few basic shops, tourist centre, a cafe and a supermarket). You can walk around the whole thing in about 15 minutes. 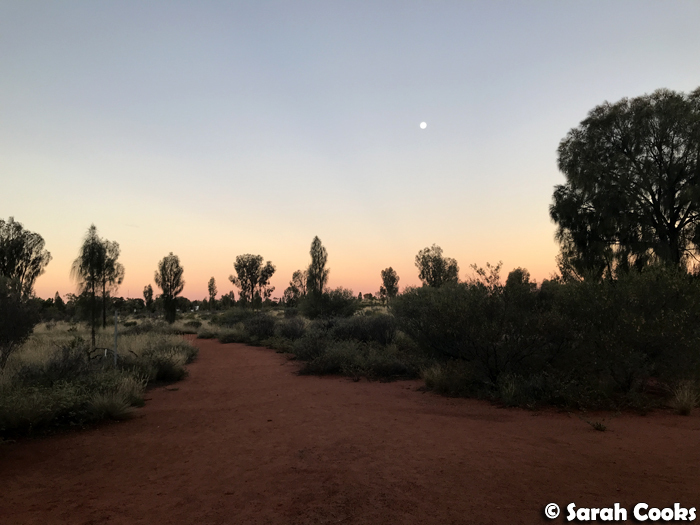 (I'm writing this from a visitor's perspective, but of course, significantly, small communities of the Anangu people, the traditional owners of the land, still live in the area around Uluru). Accommodation: There are currently seven different accommodation options at the Resort, from camping all the way through to an all-inclusive luxury lodge (sigh, one day!) 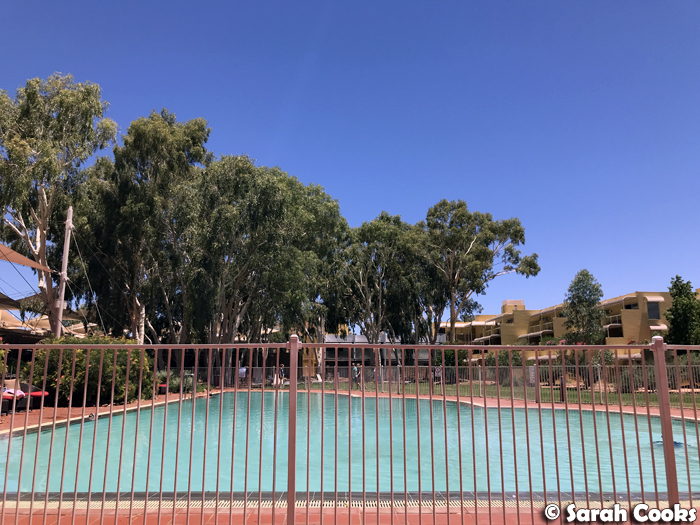 We stayed at Sails in the Desert, the 5 star option that was very comfortable and clean, with a beautiful lobby and a nice swimming pool for cooling off between visits into the national park. 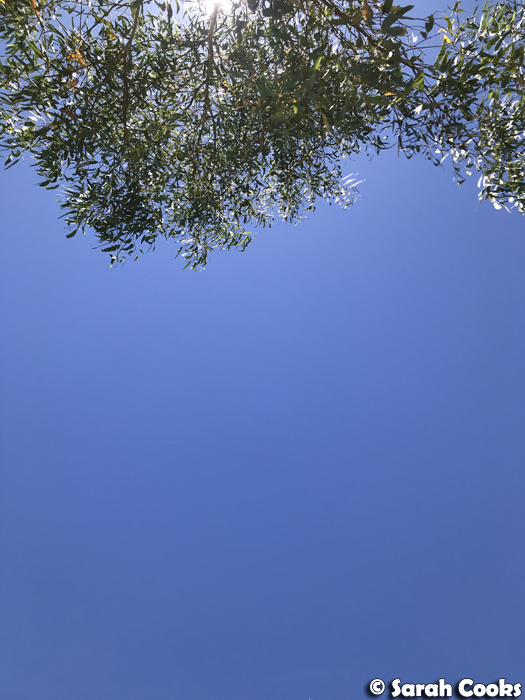 Weather: We were really lucky with the weather! We visited at the start of December but it wasn't too hot. We had clear skies and maximum temperatures in the low-thirties, which was bearable. Obviously, though, it's a desert, and average maximum temperatures can get into the high thirties in summer, and it can get even hotter at different spots in and around the rocks. Sunscreen, sturdy closed-toed walking shoes, protective sun gear and lots of water are a must! It also gets surprisingly cold at night, so don't forget long pants and jackets. I forgot to bring my long yoga pants and was annoyed at myself the whole weekend. Whoops. 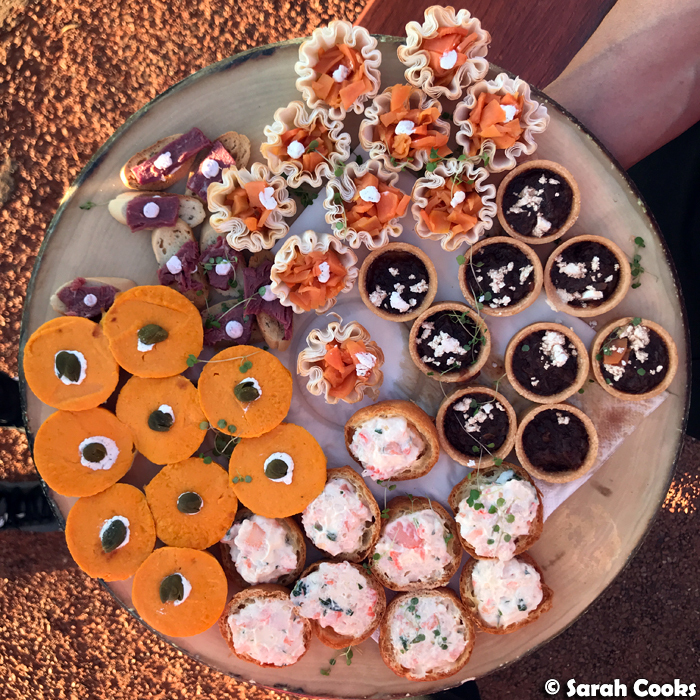 Food: Well, food isn't the reason people visit Uluru. However, we did eat quite well! 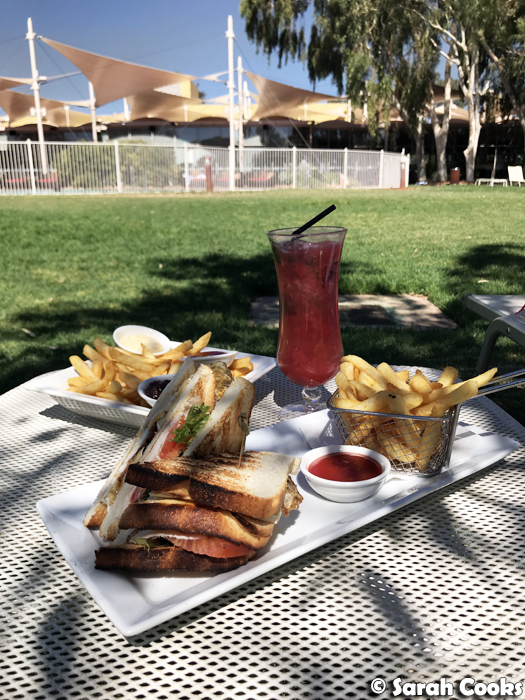 Some highlights: a very good club sandwich poolside at Sails in the Desert; nice pies, coffees and cakes with friendly service at Kulata Academy Cafe (which is staffed by trainees from the Resort's National Indigenous Training Academy); and really great steaks and cocktails in a more upmarket atmosphere at the Arnguli Grill. With that out of the way, let's talk about the sights! 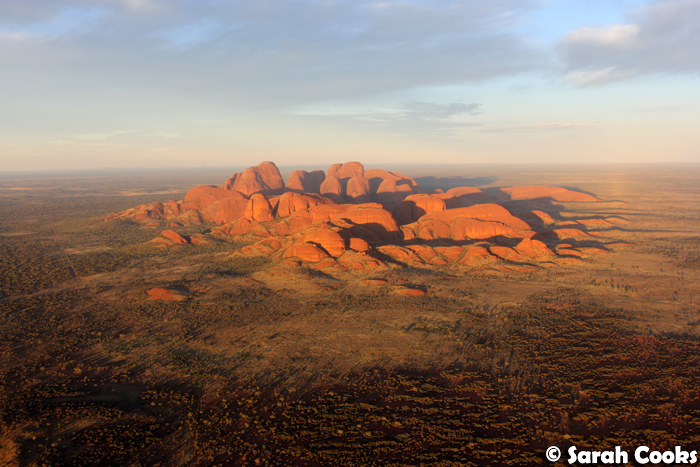 The two main natural attractions are Uluru (Ayers Rock) and Kata Tjuta (The Olgas). The magnificent Field of Light art installation is also a big drawcard, and has been extended to 31 December 2020. It's definitely worth visiting all three. 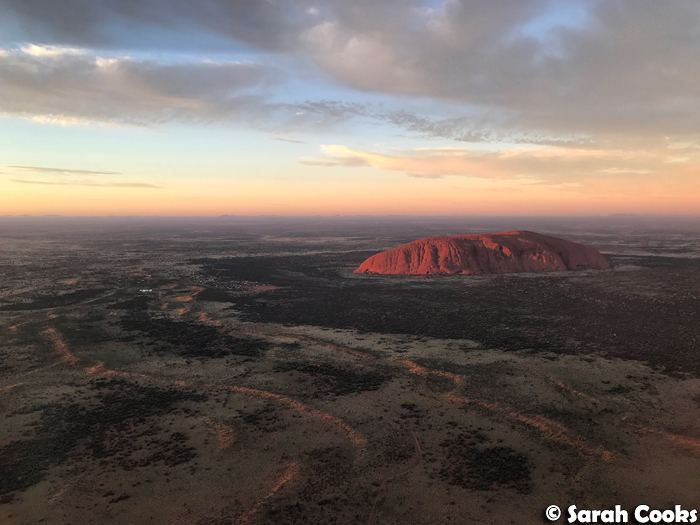 Uluru is, of course, Australia's most iconic natural landmark: a huge sandstone monolith reaching 348 metres high, 3.6 kilometres long and 1.9 kilometres wide. Apparently the vast majority of the rock, approx. 2.5 kilometres of it, is actually underground - mind blown. 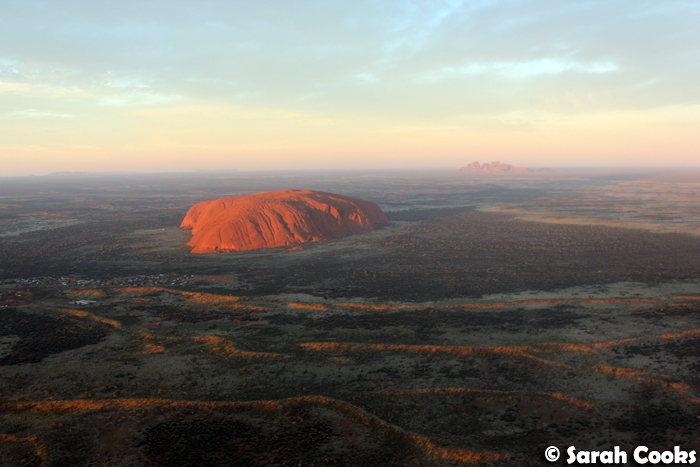 (Source: Uluru-Australia). 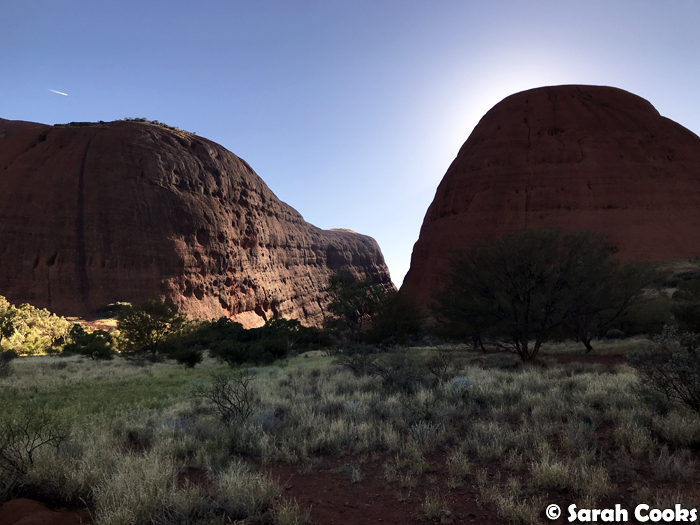 Kata Tjuta, about 25 kilometres west of Uluru, is less well-known, but no less beautiful. 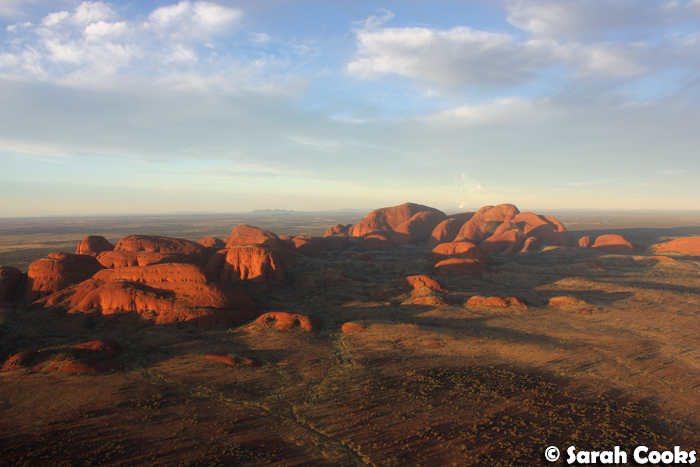 Kata Tjuta is a collection of large domed red rock formations, and is 198 metres taller than Uluru at its highest point. (Source: Wikipedia!) 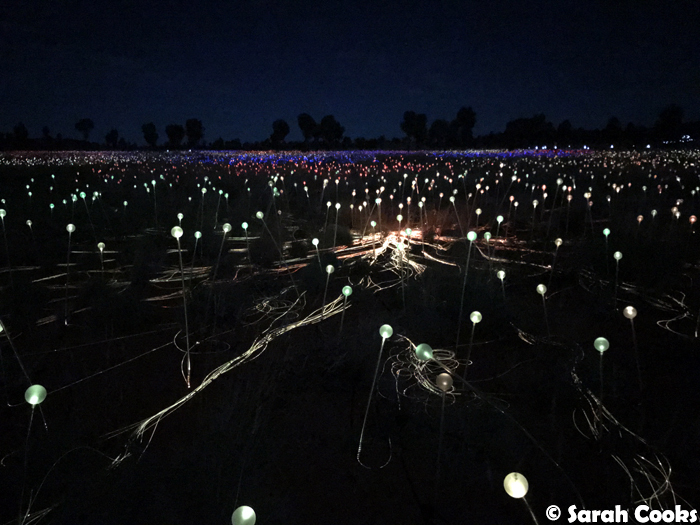 The Field of Light is a massive art installation by Bruce Munro, comprising 50,000 spindles of light that gently change colour under the night sky as visitors walk through. It is incredible. There are so many different ways to experience these wonderful sights - guided tours, self-guided walks, helicopter flights, camel rides, dinners and more! 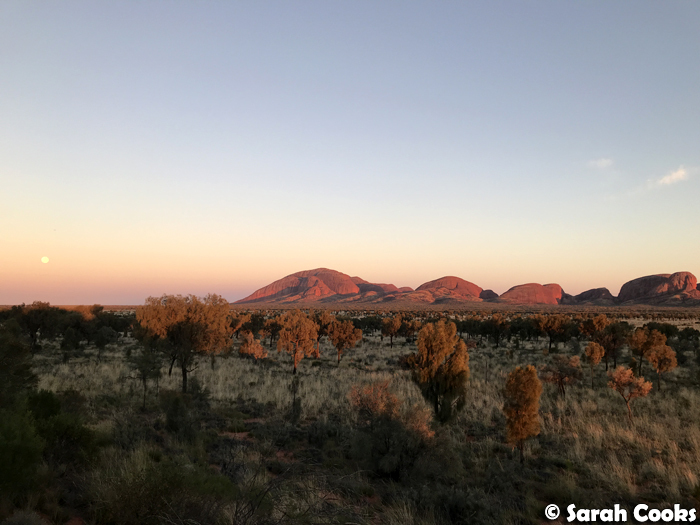 I would suggest using the Ayers Rock Resort website as your starting point. 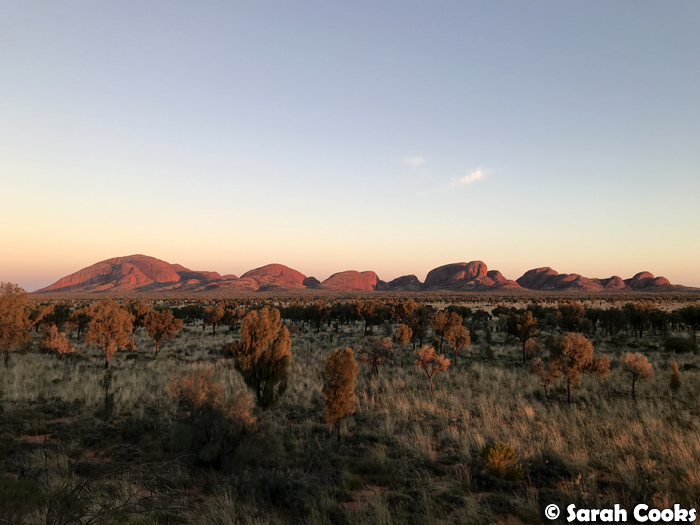 Definitely make sure you include sunrise and sunset visits to Uluru and Kata Tjuta - the rocks change colour as the sun rises and sets, and are just spectacular. 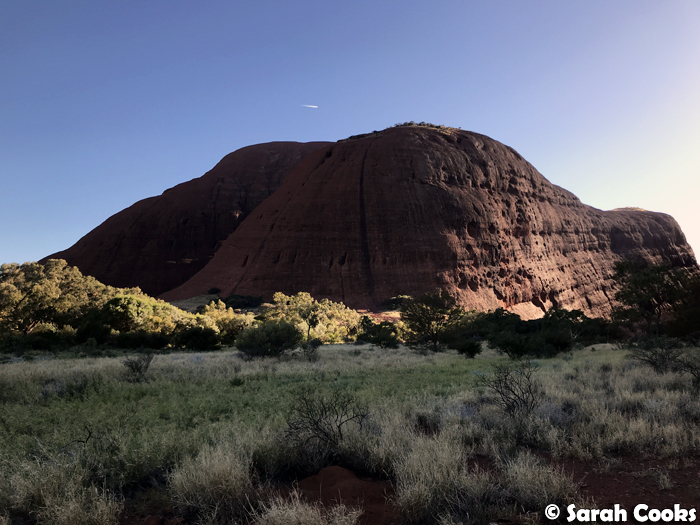 Climbing Uluru is technically not prohibited, but "the climb" is of great cultural significance to the Anangu people, and they prefer visitors not to climb Uluru (source: Ayers Rock Resort website), so we chose not to. (N.B. the climb is closing for good next year in October). 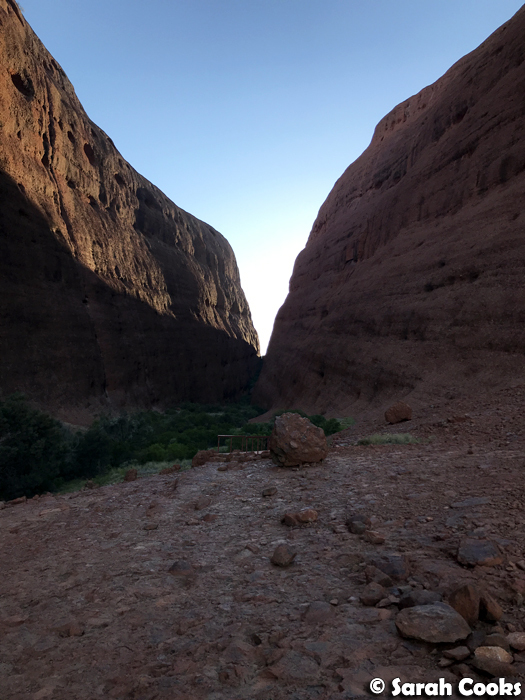 For our weekend in Uluru, we chose a sunrise helicopter ride, the Sounds of Silence dinner (which included the Field of Light), and a sunrise visit to Kata Tjuta, including a walk through Walpa Gorge. All were great and I would highly recommend them! 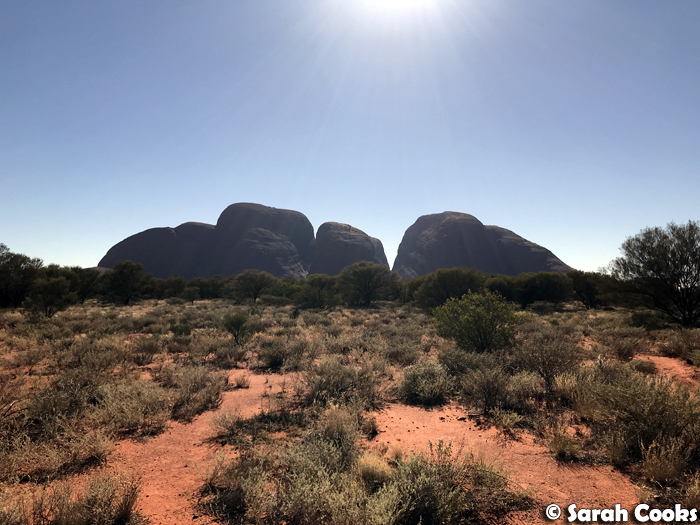 Prior to visiting Uluru, I had very little knowledge of Kata Tjuta / the Olgas, and we hadn't planned on doing a separate trip to visit them. However, after having seen them from the helicopter, I was so moved by their beauty and majesty that I insisted we book a sunrise tour for the next day to get a closer look. (Sorry Sandra, thank-you Sandra). That evening, we did the Sounds of Silence dinner. 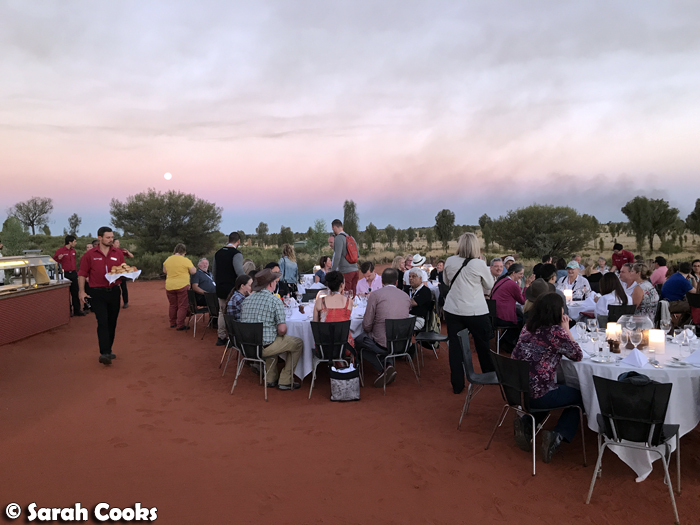 This included canapés and sparkling wine at sunset overlooking Uluru, followed by a bush-tucker inspired buffet dinner under the stars, and the Field of Light. The food was great, the setting was beautiful, and the experience was well organised - it was an enjoyable evening. The canapés were very good, and I loved the focus on native ingredients. 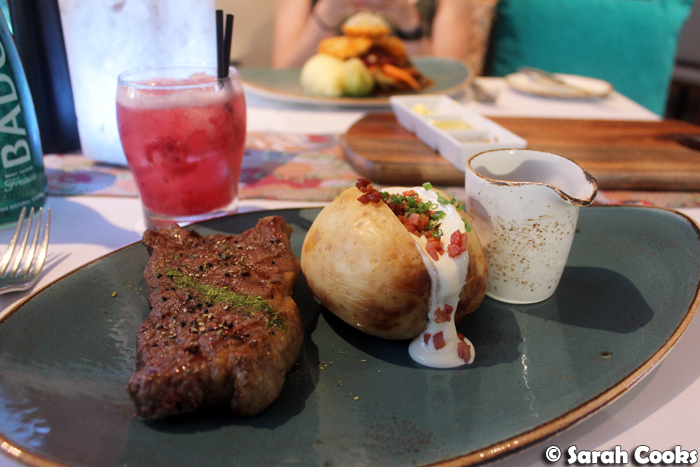 Also, looking back at my photos, it struck me that the platter kinda sorta resembles an Aboriginal dot painting. Yay. So after canapés and drinks, we were ushered down to the dining area. Dinner was three courses, served buffet style, with Australian wines and beers poured alongside. 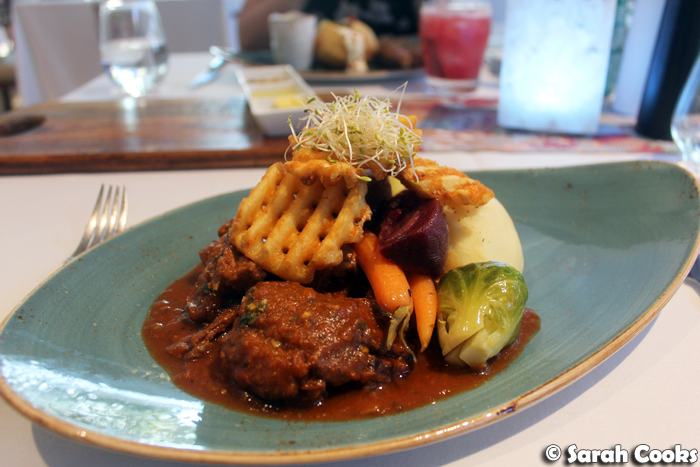 Again, Australian native flavours were featured heavily. Think options like dukkah seared kangaroo loin on quandong couscous with native mint yoghurt; mushroom and warrigal green risoni; desert lime curd tartlet; and warm pear and lemon myrtle pudding. There was also a didgeridoo player, and a star-talker to give us a guide to the night sky. What an incredible setting! Following dinner, we were led down to the Field of Light. 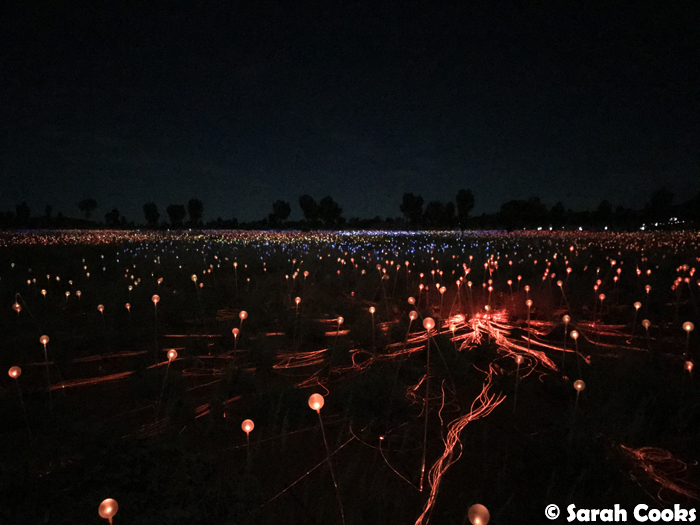 (We'd actually been the night before too, because our accommodation included a double pass to the Field of Light - we were more than happy to visit twice!) These pictures will just give you an idea of what it looks like, but it's really no comparison to immersing yourself in the installation and walking through it. It's really vast, covering an area larger than seven football fields, and it's amazing to see all the different colours glowing gently in the dark. 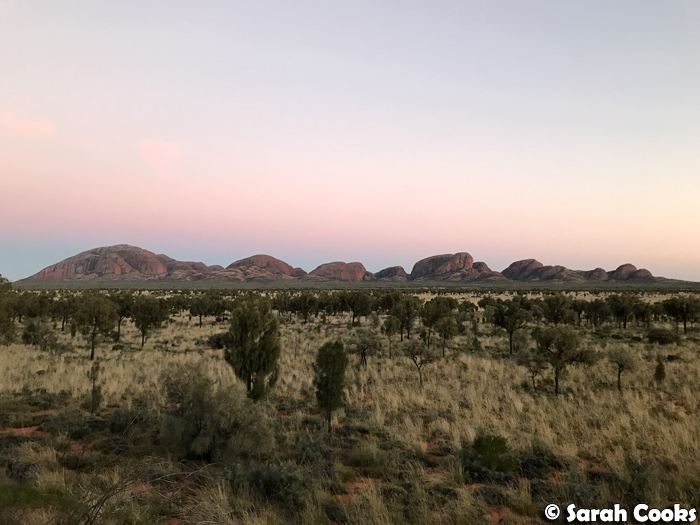 We were up bright an early the next morning for our final tour of the trip, the sunrise Kata Tjuta visit. We went with SEIT, and this tour was excellent. In particular, our tour guide was fantastic - she had a great knowledge of indigenous and Western history of the area, was informative and entertaining, and paced the tour well. 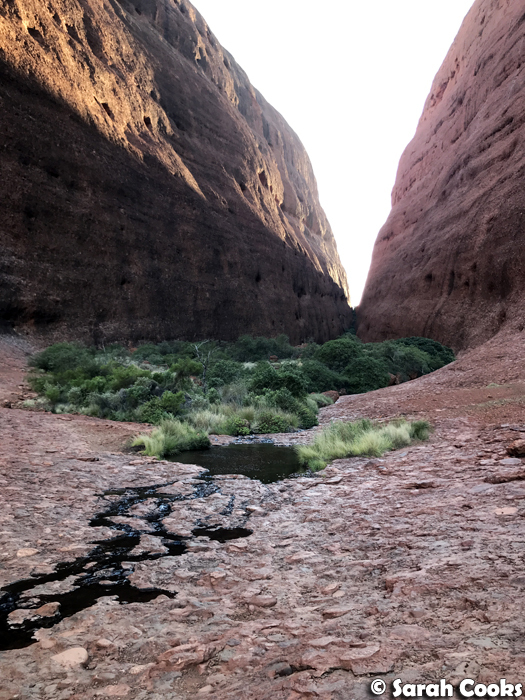 This was a five-hour tour that included a sunrise viewing of Kata Tjuta (you could just see Uluru in the distance), a walk through Walpa Gorge, and a picnic breakfast of cereal, raisin toast, juice and hot drinks. Now, pictures! 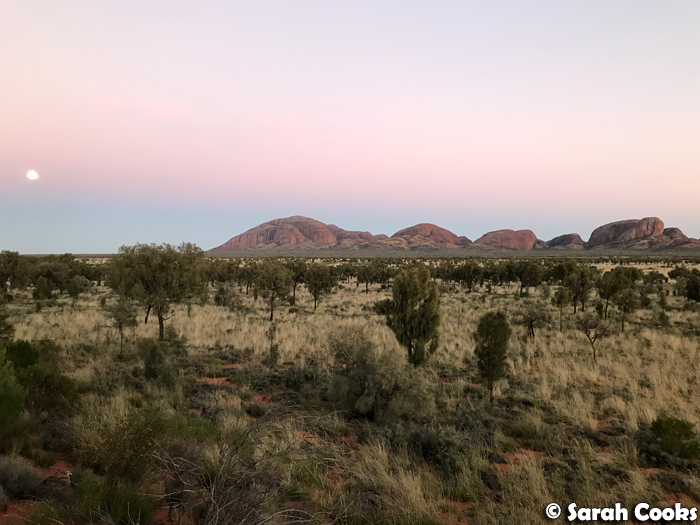 And that was our trip to Uluru! It was an amazing experience and I think it's well worth it to make a visit at least once. Have you been? Do you have any favourite sights or experiences in this area, or any hot tips for other travellers? Let me know in the comments! 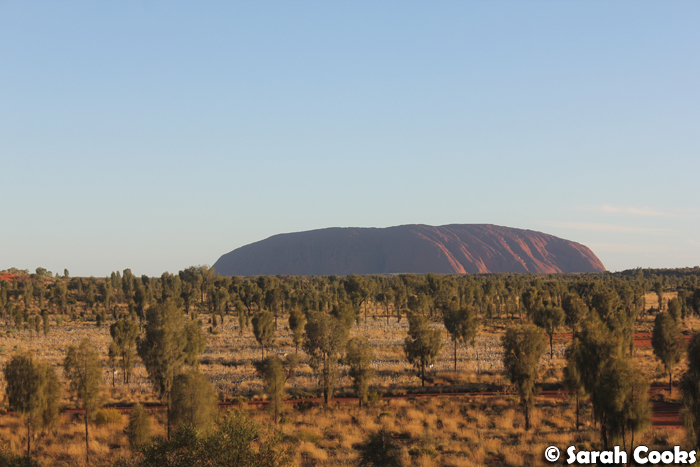 How lovely is Uluru! I read your post and we even stayed at the same hotel! If you get a chance, I'd definitely suggest doing Field of Light! It's so beautiful.